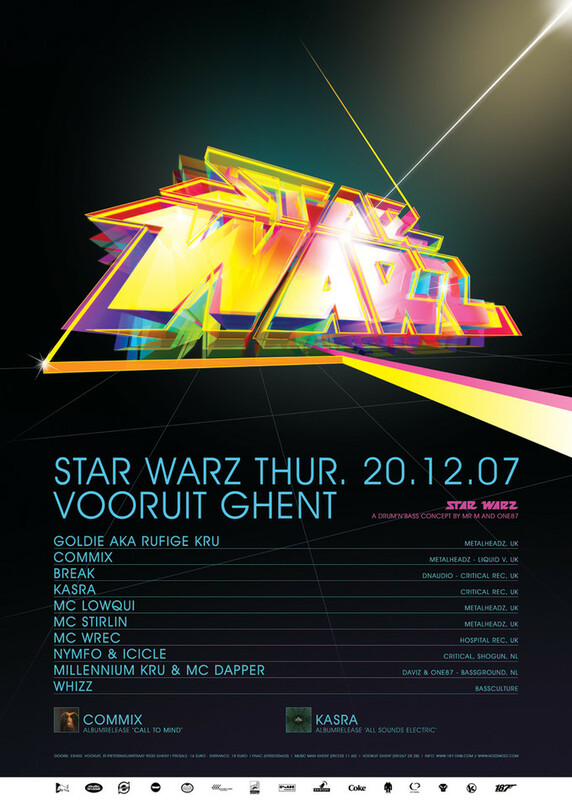 Star Warz remains the leading Drum ’n’ Bass event in Belgium. Even after almost 20 editions the Vooruit is still completely full with Drum ’n’ Bass headz, loving it all the way ! Star Warz always unites the biggest international names (Goldie, Andy C, Ed Rush, Marcus Intalex, Doc Scott, and many more) with the most talented newcomers (Commix, Break, Black Sun Empire, ...) and big names or young talents from Belgium (Millennium Kru, D Convict, Juice Blender, ...) As such Star Warz represents all styles and evolutions within the scene and gives their public a broad look into the Drum ‘n’ Bass spectrum. Star Warz wants to keep innovating. Of course, the crowd makes the Star Warz parties such a success: an open-minded, up-for-it public that admires Drum ’n’ Bass, that wants to be surprised and that creates the special atmosphere that makes everybody partying & raving! Star Warz also keeps new talent and releases in check and always invites artists at a time when they have something new in store for us. This time Star Warz features two album releases : first up is the album of one of Drum and Bass’ biggest revelations of the last years: Commix are to be found on high profile labels such as Hospital, 31 Records and Metalheadz and now present their very first full album : Call to mind , to be released at the end of the month on Metalheadz ! The second album is the first longplayer on Critical Recordings. ‘All Sounds Electric’ features Break, Calibre, Silent Witness, Lomax, Cyantific & Kasra, Dkay & Kasra and many more. The vinyl showcases the Critical sound. Quality productions brought to you by the scenes brightest stars. Rough, rugged and raw yet with a depth and electronic soul running throughout. From the deep bass driven roll out of Calibres Try, the tech funk of Passive Aggressive by Break, through to the dub step influence of Spider by Dkay & Kasra and the Detroit step of the Bad Cop by Lomax. The CD gives you 23 tracks spread across two discs. Disc one features the 6 vinyl tracks plus 7 exclusive CD only tracks from the likes of Lomax, Break, CLS and Logistics & Kasra. Disc 2 is a retrospective look at 10 highlights from the Critical back catalogue, a diverse representation of all that is good about the many sub genres and styles of Drum ‘n’ Bass. Goldie returns to his roots under the same moniker he released his very first record under nl. Rufige Kru. By doing so he captures the essence of what makes him so passionate about music: a dark, unsettling, gutsy sound going back to the roots of jungle. His ultimate tribute to the scene that captured his heart and soul over fifteen years ago called ‘Malice In Wonderland’ came out about 6 months ago. All the UK artists will be joined by three world-leading MC’s : MC Wrec from London Elektricity, The Nextmen and Stanton Warriors fame and regular side-kick for names as Goldie, Ice T and many, many more. MC Stirlin, the resident Metalheadz MC who has joined about any big name from the scene on stage and MC Lowqui known for his lyrical flow and many radio appearances ! For Nymfo from the Red Zone Crew from Eindhoven it is also not his first appearance on Star Warz but this time he brings his colleague Icicle along who’s receiving a lot of support for his tech funk Drum ‘n’ Bass sound. The international guests will get the full support of the residents Millennium Kru, who have struck up a new alliance with MC Dapper. And Star Warz wouldn’t be Star Warz if they didn‘t leave a spot for up and coming talent from Belgium : DJ Wizz definitely falls into that category and on top of that, he also has a track on the new Critical album ( with Daze).